Cut lime/lemon in half. With one half, clean the fish by rubbing and squeezing the juice inside and out. Rinse under cold water, pat dry and place in a shallow dish. Reserve the juice of the other half of lime or lemon. Season the fish inside and out with salt and pepper. Add the garlic, parsley, thyme and onion, hot pepper or add a couple drops of hot sauce. Toss fish with herbs, cover and let marinate for 30 minutes or more. Remove herbs and other aromatics from fish and set aside. Heat oil in a large pan, add tomato paste and let cook, stirring until almost incorporated with oil. Add chopped tomato, and continue to stir until slightly wilted. Add the herbs and aromatics from marinade, and let cook with the tomato mixture 1 to 2 minutes. Gently place the fish into the tomato mixture. Once it starts to cook, add the lemon/lime juice around the fish. Gradually add the water, alternately basting fish with the sauce. Season with salt and pepper to taste and continue to baste until all the water has been added. Turn the fish once to cook on the other side (turning it more than once will cause the flesh to break.) Continue to baste for about 1 to 2 minutes. 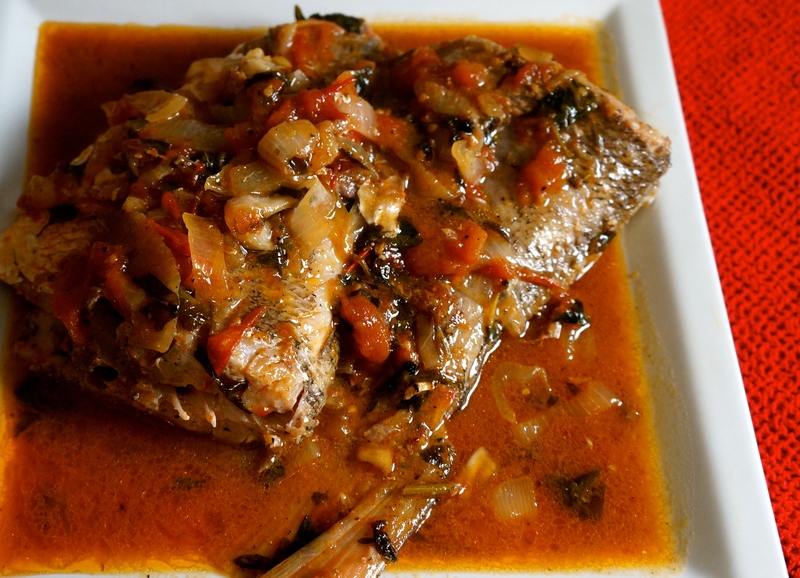 Cover fish and let simmer 5 to 10 minutes on low heat, depending on size and thickness of fish. Uncover and baste until completely cooked. Remove from pan and serve hot.